If you love patio container gardening and are either limited on space or just want to show off your plants in a unique way, then check out this cool new Mr Stacky Planter. 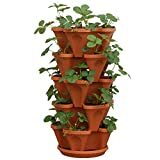 This vertical 5-tiered planter tower has growing spots for up to 20 plants like strawberries, flowers, herbs, vegetables, succulents, and more in any combination you choose, while using up only one square foot of vertical space. Once everything is planted, just water the top tier and it flows down through all of them, preventing over-watering and root rot. You can also break it into separate stacks if you chose as well. I actually picked one of these up a week ago and planted snap peas, mint, peppers, and these weird Hula Berries (white strawberries with red seeds that are supposed to taste like pineapples!) and it was all pretty effortless to get everything planted. You just insert your plants into the spaces, add soil to fill it all in, and stack. Each tier also has a 3/4 inch hole in the center allowing you to insert a PVC pipe for extra stability in windy spots or to create grow towers that are off the ground. Cool huh?